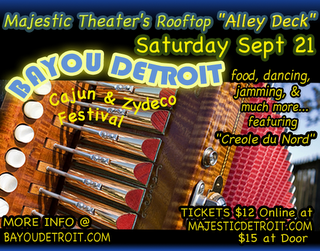 Creole du Nord is playing for the 1st “Bayou Detroit” celebration at the Majestic Theatre in Detroit on Saturday, September 21. The event starts with an open Cajun jam session at 6:00 pm (musicians, bring your instruments! 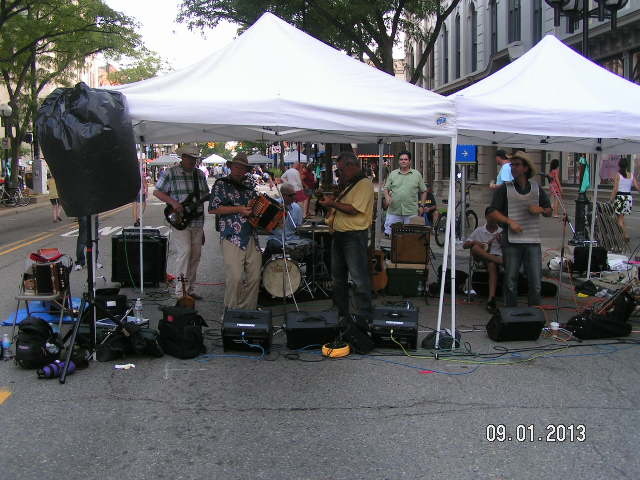 ), then there are zydeco (and Cajun two-step) dance lessons at 7:00 pm, then Creole du Nord plays from 8:00 to 11:00 pm. Tickets are $12 in advance (can be ordered online at the Bayou Detroit link above), or $15 at the door. The party is actually on the Majestic’s rooftop “Alley Deck” which is on the roof, overlooking the alley below. The Majestic Theatre complex is at 4120 Woodward Ave. in Detroit, MI. There is limited parking right behind the Majestic; get there early to grab a spot. You may be able to find a spot on the street, but most of the street parking has meters that are only good for two hours, although I believe the city stops enforcing the meters after 8:00 pm. Don’t take my word for that, though, as parking may have changed around there. The Bayou Detroit web site also mentions “Cajun food on the outdoor grill” and then lists a Crawfish Boil 1/2 lb for $7.50 and Chicken Gumbo served with Fried Okra for $5.95 so I believe those are additional charges to the admission fee. It sounds like y’all could pass a good time at this event. I’m hoping to make it there in time for the jam session, although I have been fighting off a cold. Bonjour, y’all. Y’all have two chances to see Monsieur Guillaume & His Zydeco Hepcats the weekend of September 20-21, 2013. On Friday, Sept. 20, they play at the American Legion Hall at 2079 W. 12 Mile Rd. in Berkley, MI. There is a “Zydeco Steak Out” at 5:00 pm, the Hepcats play starting at 8:00 pm. I’m sure there is a cover/food/beverage charge. Call 248-542-7668 for more info. 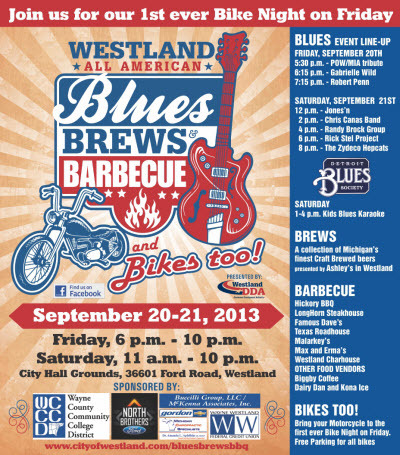 Then the Hepcats play at Westland, Michigan’s “Blues Brews and Barbeque” on Saturday, Sept. 21. The Hepcats play from 8:00 to 9:30 pm, other (non-CZ) bands also play starting at noon. This event actually starts on Friday, Sept. 20, but the Hepcats only play there on the 21st. Blues Brews and Barbeques is at the Westland City Hall Grounds, 36601 Ford Road. Did I ever mention that there is a regular group of musicians who get together to play Cajun music in Ann Arbor, MI, every Monday evening? In the summer, they gather at the Argo Canoe Livery at 1055 Longshore Dr. If the weather is stormy in the summer, and in the fall/winter/spring, they meet at the Northside Community Center at 815 Taylor. The musicians usually start to gather around 5 pm and play until 9 pm or so, but on Labor Day, Monday, September 2, 2013, they plan on starting around 4 pm at Argo. It’s also planned as a barbeque/cookout, so if you have food you want to grill and/or share, bring it! Also bring musical instruments if you want, although listeners are welcome too. And, although they have some picnic tables with benches under a shelter roof, you may want to bring a camp chair in case there are many people who show up. Also bring mosquito-repellent! Note that the Argo Canoe Livery does not have much parking right at the livery, and that folks renting canoes also want those limited parking spots. There is overflow parking about a block away uphill on Longshore Dr. You could always drive down to the livery and unload instruments, etc, then park up on the hill and walk back to the livery’s picnic shelter. For the jams at Northside, there is street parking in front of the center, plus a nearby parking lot. 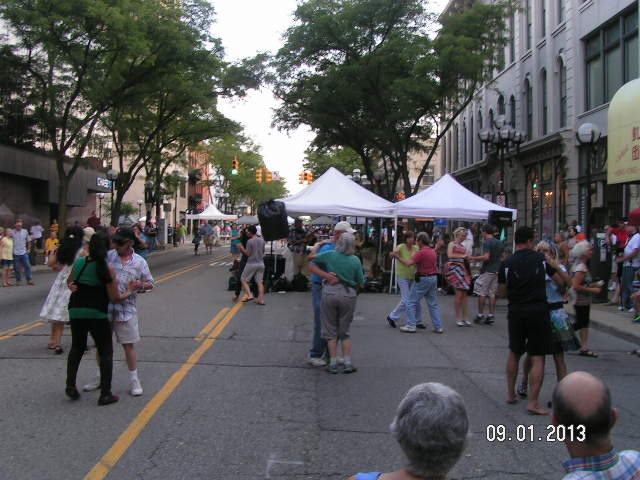 Beaucoup folks enjoyed themselves in downtown Ann Arbor, MI, on Sunday, September 1, for Dancing in the Streets. The morning weather looked like it wanted to rain, and while I was contra dancing around 2:30 pm I felt a couple of rain drops. But after that the weather cleared and the sun shined through the clouds. It wasn’t too hot, but was very humid. The humidity was perfect for the Cajun and zydeco music of Creole du Nord from 5:30 to 6:30 pm. I was able to pass a good time dancing with some folks then. Saw some folks I hadn’t seen in a while, like Ken and Lois, who you can see at many Michigan CZ dance events. Susan Filipiak gave some Cajun and zydeco dance lessons, and while the lessons were generally good, I wish she wouldn’t have taught folks to zig-zag from side to side while two-stepping as it makes it harder to pass slower folks who continually zig in front of you when the dance floor (or in this case, the dance street) gets crowded. She also taught something she called the “crooked two-step” that some of us knew as the “Mamou Two-Step.” For those who don’t know, the Mamou Two-Step is a variant where you lead with two steps to one side but only one step on the other side. Basically, the leaders will lead with two steps with their left foot and only one on their right, while followers will lead with two steps with the right foot and only one with their left foot. It’s easier to see and dance than it is to write about it. I was pleased that I was able to do a lot of dancing at this year’s Dancing in the Streets. I danced the entire contra dance from 2 to 3 pm, then did a waltz workshop from 3 to 4 pm. Tried to dance to some English Country Dancing, but I was beginning to wilt from the heat so took a break to sit down and cool off by drinking a quantity of water. Then managed to dance most of the CZ dancing, too. Maybe we’ll see the rest of y’all at next year’s Dancing in the Streets!